See, here’s what I’m talking about. There, in the bowl, is torn-apart naan and on top a big heaping mound of yogurt that’s been thinned with a little milk (and allowed to sit for a bit so it sours). Also, I added the garlic directly to the yogurt so it would take on some of the garlic flavor, a bit like what happens with Tzaziki. Now you toss that together and the bread magically transforms. It gets so saturated with the yogurt it becomes almost like cheese. That’s how Craig and I both described it upon eating the salad. 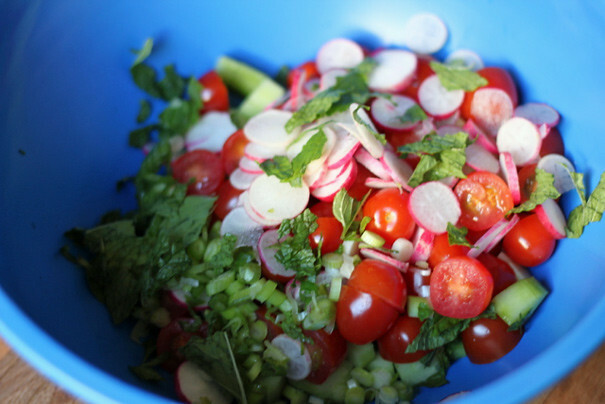 If that sounds weird, don’t worry, it’s all broken up by beautiful vegetables: tomatoes, radishes, cucumbers, green onions, and mint. You add those to the bowl with the yogurt-saturated naan pieces and toss that all together; then things get even better with olive oil, white wine vinegar, and lemon juice. It’s a salad that comes together in stages and, if you’re me, you’ll be tasting all the while. By the time you get here, you’ll want to adjust with vinegar, salt, pepper, etc. Then you spoon the salad into bowls and sprinkle with sumac, as Ottolenghi suggests, or do what I did and just sprinkle everything with za’atar because that has sumac in it anyway. What results is a surprisingly hearty salad. Those yogurt-saturated pieces of naan fill you up in a way normal croutons never will. Plus, yogurt is kinda healthy, and then all those vegetables? It’s a healthy dinner that doesn’t feel like a healthy dinner which is my kind of healthy dinner. 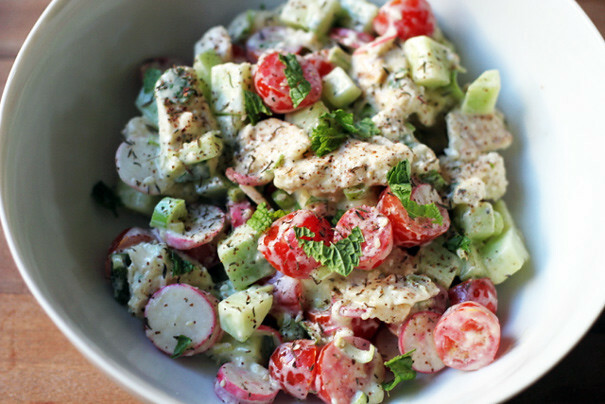 So shake that fat tush and make a fattoush: it’ll be a fat tush no longer. Summary: Adapted from Yotam Ottolenghi’s Jerusalem. Start by mixing the yogurt and milk together and, if you have the time, let them sit for a few hours in the fridge until bubbles form on the surface (it creates a kind of homemade buttermilk; you could always use an equal amount of buttermilk and skip this step). Or just mix them and proceed like I did and all will be well. 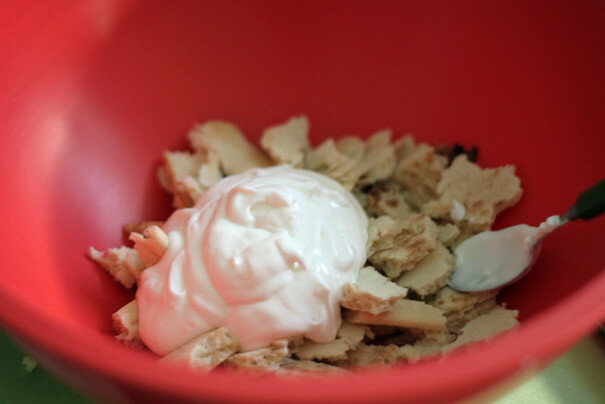 Also, add the garlic to infuse the yogurt with the garlic flavor. Now tear the bread into bite-size pieces and place in a large mixing bowl. 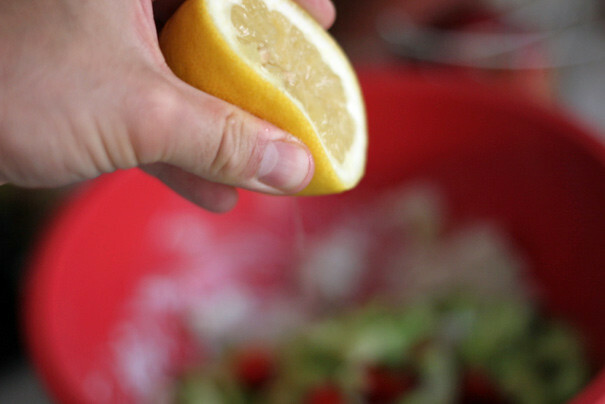 Add the yogurt mixture followed by the rest of the ingredients, tossing well and tasting to adjust for olive oil, lemon juice, vinegar, etc. 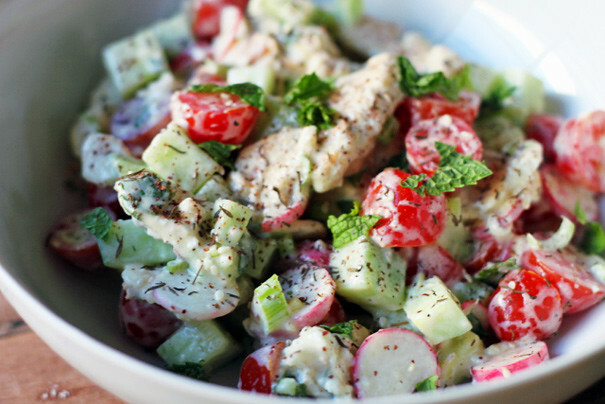 Spoon into bowls and sprinkle with sumac or za’atar before serving.